If you've ever visited a blog before, more likely than not you have run across one with a ton of ads all over it. 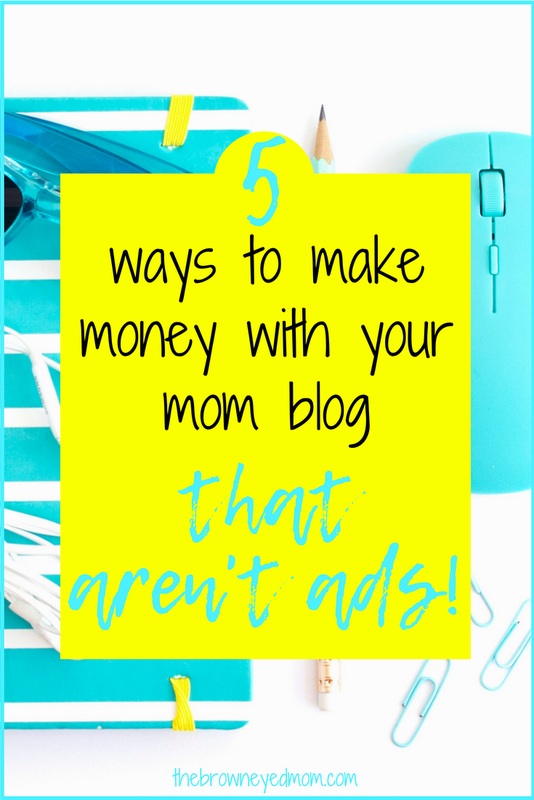 While ad networks can be a way to make money with your blog, I'm not terribly fond of them when they are overused. I run Adsense on my blog on and off and made a decent chunk of change doing it. I don't make consistent money with them, though. And the more blogs I visit that have ads all over them, the more I'm turned off by the blog, no matter how good the content is. I know a lot of you feel the same way too. You see a beautiful pin with an eye-catching title on Pinterest and click through. When the website you are visiting finally loads, you are bombarded with sidebar ads, pop-up ads, etc. You cringe, try to X out of as many as you can, and finally give up and leave the website. That's really not what I wanted of my blog. I still have banner ads from affiliates that I use in my posts, but they are relevant to the content and are hand picked by me. It really makes a big difference. Like this one below. It fits the content of this post, has a great design and is appealing if you're looking to use a scheduler for Instagram and Pinterest. You can also (tediously, may I add) change your expectations of Adense ads and, in my opinion, work well as long as they aren't overrunning your blog. I have mine set to run just 1 ad at the top of the page only on mobile that can be easily moved out of the way. 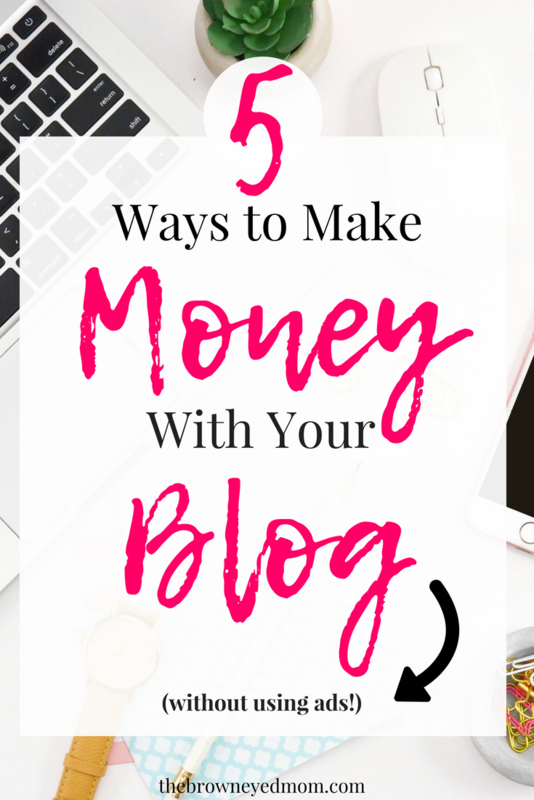 But, there are really much better ways to make money with your blog. Let's take a look at 3 different ways you can monetize your blog without the use of ad networks. This is one of the easiest and simplest ways to make money with your blog. Everyone already uses products that they know and love, so why not recommend them to your readers in the process. I will insert a warning here though too. Just as a blog full of ads is annoying, so is a post that has an affiliate link every sentence. While you may be tempted to put a link every single time you mention something, more likely than not, it will not convert well. I also recommend only promoting products you know, have used, or really love. You can also use products that you want to try out as well, but I always try to make sure to say that I've never used X product, but given the chance, I would love to. This way, you keep the authenticity and trust of your readers and they know you aren't just trying to sell to them. And... Always, always, always disclose. Not only is it a way to share with your readers that you will make a commission on what you are recommending if they buy from you, it's the law. The FTC has specific rules about disclosing and they should always be followed. Here's a great article from the FTC on disclosure if you need help. If you're stumped with affiliate marketing and how to make it all work, click through the banner below to check out Ana over at The She Approach. 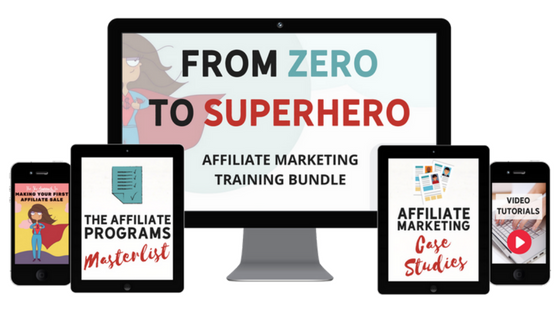 She offers an Affiliate Marketing Training Bundle to help you get past the slump and start really making affiliate income. She also has a free, 5 day email course you can find here. You can also see a list of all her ebooks and courses here. While I haven't dabbled in the world of freelancing (yet! ), if you're a good writer, this is an excellent way to make extra income. There are many sites you can sign up for, like Upwork, to find freelancing jobs. A word of caution with freelancing, though. If you are really overwhelmed with writing content as a blogger, freelancing may not be for you at the time. In my opinion, you need to have your blog game going and posting regularly before you think about freelancing. A great resource for freelancing if you're wanting to get into it is Elna Cain. She knows what she's doing! On that same note, if you've cracked the Pinterest or social media code, you can also offer services as a VA for other bloggers. Whether you offer social media management, graphic design services, etc, it's a great way to make extra income for your blog. You can promote yourself on your blog or on websites like Upwork, in Facebook groups (that allow that type of promotion), etc. This method can bring in passive income if you create a product or course that your readers would utilize. This is a really great way to not only share your knowledge about a topic, but make money with it once you're done. I will say, though, that while this is a great income stream to add to your blog, be sure you are creating e-books and/or courses that not only pertain to your audience, but on topics that you truly know about. Courses and e-books are promoted heavily as a passive income source for bloggers. While this is the truth, you shouldn't create a course on a blogging strategy if you've been blogging for just 2 months and your audience likes your travel blog. More likely than not, this will keep people from wanting to buy your course or e-book because they will not see you as an expert in that area. I am a mom blogger that mostly covers SAHM topics, organization and any blogging tips I come across along the way. My audience is mostly moms and mom bloggers. So when I created an e-book, Sleep Training Your Reluctant Toddler, it has done well with my audience. If I had created a course on How to Travel Europe For Less than $1000, it would flop because a) I have no idea about anything when it comes to travel and b) I'm not a travel blogger and my audience doesn't come to my blog for that topic. I also have bullet journal printables and am working on more to add to my products page soon. So, while yes, e-books and courses can be great income streams, be very aware of what you are knowledgeable about and what your audience wants from you before you proceed. I cannot tell you how many courses and e-books I have run across on other blogs and wondered why in the world that blogger decided their topic was a good idea for their brand. And then you see them in Facebook groups asking why their product isn't selling. You wouldn't want to buy a new laptop at the grocery store. This is the same concept. What are your favorite ways to make money with your blog? Drop me a line in the comments!